Interface can also be used with other software supporting the ELM327 chipset. Connect your PC to your car! 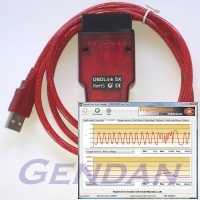 Easy-to-use multi-protocol package to connect your PC to any OBDII or EOBD compliant car (2001+ petrol car, 2004+ diesel car). Why take your car to the dealer for a code-read? You can now read and clear your engine fault codes, and view live engine information on your own driveway! Why doesn't it work on all cars from 1996? "The same/similar product from other suppliers works on all 1996 and newer cars...why doesn't yours?" This interface will allow you to connect to your EOBD or OBDII compliant car. These are petrol cars sold from new within the European Union from 2001 and diesel cars sold from 2004. For information on the pins required in the diagnostic port for the support of each of the above protocols, please click here. Please note the price of this item includes a licence for the EngineCheck software, which requires activation before use. If the product is returned to us as an unwanted item, or because it was purchased for an incompatible vehicle, we cannot provide a refund of the cost of the software (£30.59) once an activation code has been requested. Do I need a different interface/connector for each car? Does the interface ship with software on CD? Do these interfaces work with UK cars before 2001? I have seen these/similar products advertised as working on all 1996 and newer cars - why don't these? Will it reset the ECU and Check Engine light (MIL)? Will it reset Airbag, ABS or Service lights? EOBD compliant cars are petrol cars sold in Europe from the beginning of 2001, and diesel cars sold from 2004. EOBD is an abbreviation of European On-Board Diagnostics. This is the name given to a European Directive implemented to control the vehicle emissions. OBD-II (On-Board Diagnostics, Second Generation) is the US equivalent of the European EOBD standard. This came into force in 1996 for all cars sold in the US. These interfaces will allow you to connect to your EOBD or OBDII compliant car. These are generally petrol cars sold in Europe from 2001 and diesel cars sold from 2004. If you can see your 16-pin diagnostics port in your car, you can also check which interface will work by checking the pins present in the port. Click here for more information. The interface package doesn't ship with a CD, as the software and drivers are very small downloads. Full details on downloading the drivers are included with the interface. 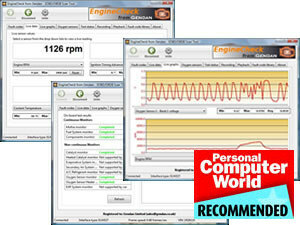 Your purchase includes our new EngineCheck diagnostics software. Other software that supports the ELM327 chipset can also be used with the interface. This is a very frequently asked question. In many cases, no. However we have found that many Asian manufacturer cars are supported back to approximately 1999/2000. We have also found that many Ford and Jaguar petrol cars are supported back to approximately 1997. Please email us if you are unsure whether your car will work before ordering. This is definitely one of our most frequently asked questions! Please click here for a detailed answer to this question. Will it reset the ECU and Check Engine light? These interfaces will allow you to erase the fault codes from the ECU memory, and switch off the 'Check Engine' light (or Malfunction Indicator Light (MIL)). In erasing the codes, they reset the ECU, which also erases any 'learned' settings, e.g. fuel trim adjustments. These will be re-learned automatically by the car during subsequent drive cycles. Resetting the ECU is not harmful to the car. No, the tools will not reset these lights, or read codes from these systems. These packages communicate with the EOBD/OBDII systems in the car, which are primarily the engine/emissions diagnostic systems. These are linked to the 'Check Engine' or 'Malfunction Indicator Light' (MIL). The packages will reset the 'Check Engine' light, and will clear any associated fault codes. Fantastic product and excellent after sales service. This was my first attempt at fixing my renault master 2007 van and found the diagnostics port easy enough. plugged the dongle in, phoned gendan for some port info, then 60 seconds later, up came the fault code, with explanation of what was wrong. In my case, it was the mass air flow sensor. Looked up the problem on the renault forum, disconnected the sensor as suggested and hey presto, the van fired up again! Will now replace sensor and air filter. Happy Chappy! I dont normally write rave reviews about products, but in this case its very different. I have Played about with code readers for some time, both via friends & local indie garages, the pro tools are extremely good, but also extremely expensive, whilst the E-bay ilk of hong-kong-fuee specials leave a lot to be desired. A simple code reader will flag up a number of abnormalities, but not tell you which is the initiating event, which are the consequential events. For this you need to be able to explore log live data. This EOBD scan tool does just that. Firstly I was able to diagnose a air flow sensor problem on my daughters Astra which had been through 3 different Vauxhall garages in the last year costing several hundred pounds a throw, still not fixing the problem. I was able to find that the air-flow sensor was sensitive to differing ambient air temperatures, even sensitive to whether the bonnet was open or closed - the hotter it got the less air flow it sensed, so screwed up the mixture etc etc - £55 sensor 10 minutes to fix - job done. Secondly, My Mercedes kept on flagging up mixture problems, for various reasons over the last 9 months. It would always reset, before coming back in the next few weeks. Fault code readers did nothing for me, except telling me to change every sensor fitted to the car - twice - however the live data analyser showed an air leak caused by a broken bit of plastic. The over zealous hammer swinging mechanic at the main dealer / rodeo rider garage repaired the leak with sellotape, which was falling off. A small tube of proprietry resin adhesive & 10 minutes work - fixed. the Absolute Great thing about this bit of kit is the GUI. It is extremely user friendly. Code readers are OK, but when linked to kit where you can actually see what is happening is absolutely essential with some faults. all this for just £75. If this letter encourages somebody else to buy this bit of kit, then great, congratulations, it is the best £75 you have ever spent. As an Owner Driver/Dad/Grandad/Mr Fix, I cannot justify spending Loads-a-Money on some of the extremely fine equipment out there, but with this equipment & a bit of common sense you can do just as well, if not considerably better than some so called Experts . Excellent equipment, easy to use, the best £75 I have ever spent - Thanks GENDAN. A truly excellent piece of kit I have used it with success on Toyota, nad Citroen petrol powered vehicles, but have yet to use it on Diesels. It removes a lot of guess work from diagnosing problems if only this were available when I was an Apprentice.